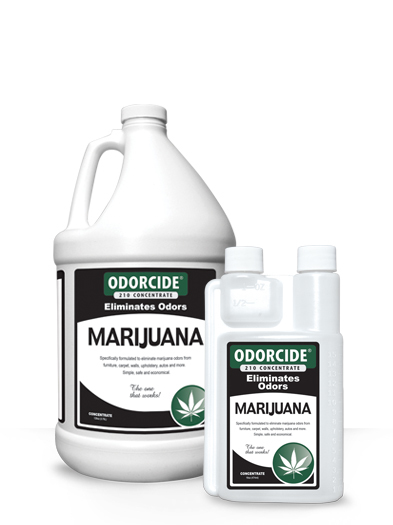 Odorcide 210 for marijuana is a safe and effective tool for eliminating marijuana odors from furniture, carpet, walls, upholstery and more. Add 4-8 oz of concentrate to 1 gallon of water or cleaning agent. Apply directly to surfaces affected by the odor ensuring the product reaches the odor source. Absorbent cloth materials must be saturated to guarantee the solution reaches the malodor. If possible, allow the items to air dry (fans or dryers can be used to accelerate the process). Repeat, if necessary, to effectively reach the odor source in all areas. Remove all unattached items such as drapes, rugs, furniture, etc. from the affected area, close all windows & doors, cover any sensitive items that can’t be removed and turn on the central heating/air conditioning system. Dilute product per label instructions and add to the fogger, carefully following the directions supplied with the unit. Insure all people and pets are out of the area. Fans help force Odorcide Marijuana into cracks and crevices where the odor source may be difficult to treat. The length of time fogging depends on the severity of the odor and the size of the affected area. The concentration can also be varied depending on the severity of the odor. For extreme situations, Odorcide Marijuana can be used in conjunction with ozone treatments to maximize effectiveness. Dilute 4-8 oz per gallon of water into a trigger sprayer or ULV fogging system. Lightly spray onto interior surfaces of the vehicle and into the exhaust ports/vents of the heating/air conditioning system. Allow to air dry and use fans if possible. Repeat, if necessary, to eliminate any remaining odor. All Thornell products are safe for use on any surface. As with any product, follow the label directions. Contains water, proprietary essential oil blend and preservatives. Keep out of the reach of children. For external use only. Effectiveness decreased when using with Chlorine solutions. Always spot test for color fastness.